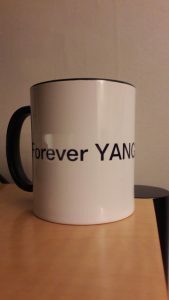 Just after IETF 101 in London, let’s analyze the current state of affairs in the YANG Data Models world. Note also the previous “YANG Data Models in the Industry: Current State of Affairs” from the last IETF meeting in Singapore. 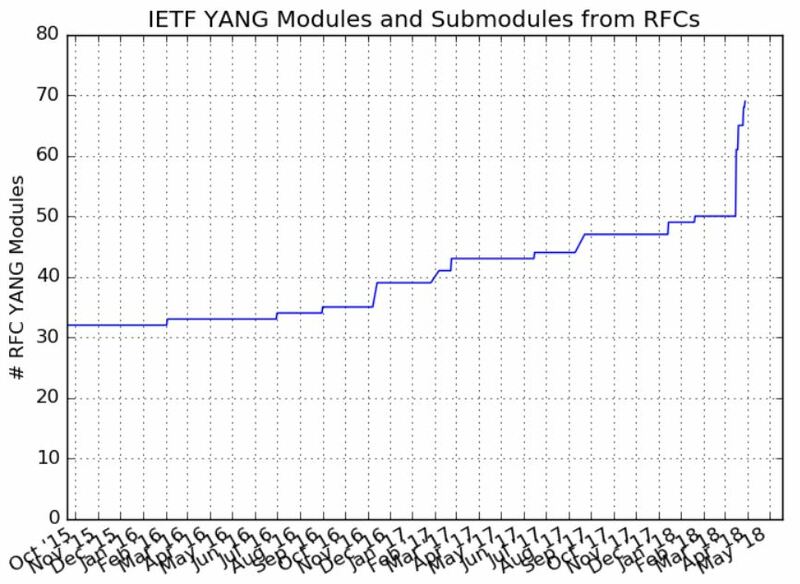 With RFC 8342 bottleneck removed, many YANG modules are now published. 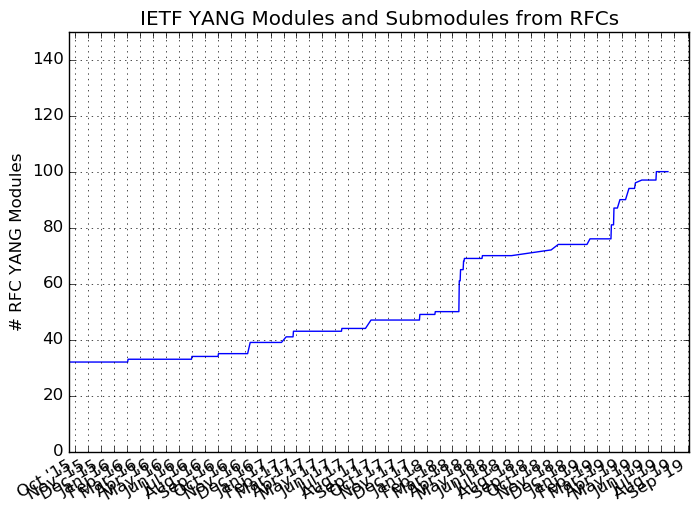 We finally seeing the exponential growth in the number of IETF YANG modules published, as can be seen in the recently updated figure below (most up-to-date figure here). So plenty of YANG modules to be published soon to further improve the hockey stick figure. And some more in the pipe, for sure. 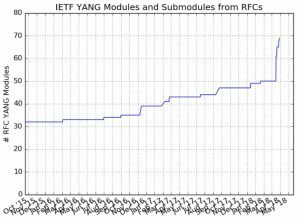 Recently, the NETMOD WG finalized the “Guidelines for Authors and Reviewers of YANG Data Model Documents”, draft-ietf-netmod-rfc6087bis-20.txt. It’s a RFC bis document that incorporates an extra seven years of experience to RFC6087: A key document that many should read. During this IETF in London, we found a way to escape from the schema mount impasse, an issue that lasted since the Working Group last call in November. As a quick reminder, the schema mount defines a mechanism to combine YANG modules into the schema defined in other YANG modules. Sometimes, magic happens when people speak to each others face to face. 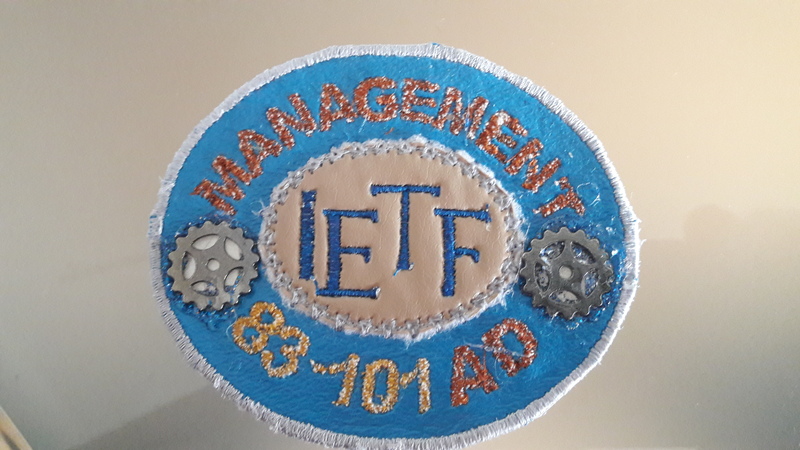 It did happen last week, when the version 9 of draft-ietf-netmod-schema-mount was posted: this version makes everybody a little bit happier! After the Working Group last call, it should move fast to RFC publication, unblocking two key YANG documents already in the RFC editor queue: the logical network element (LNE), an independently managed virtual device made up of resources allocated to it from the host or parent network device, and the network instance module, which can be used to manage the virtual resource partitioning that may be present on a network device such as VRF and VSI. The NETCONF Working Group rechartered, with a more open ended charter. mechanisms supporting the operational deployment of systems using the protocols. 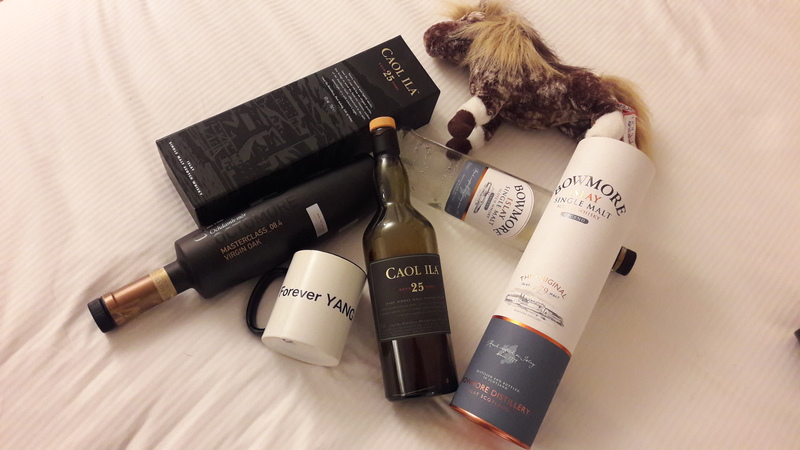 In the Hackathon, Joe Clarke and I dedicated our time to the maintenance of the YANG catalog, while Mahesh Jethanandani added the MEF YANG modules, and Vladimir Vassilev focused on the validating YANG examples. 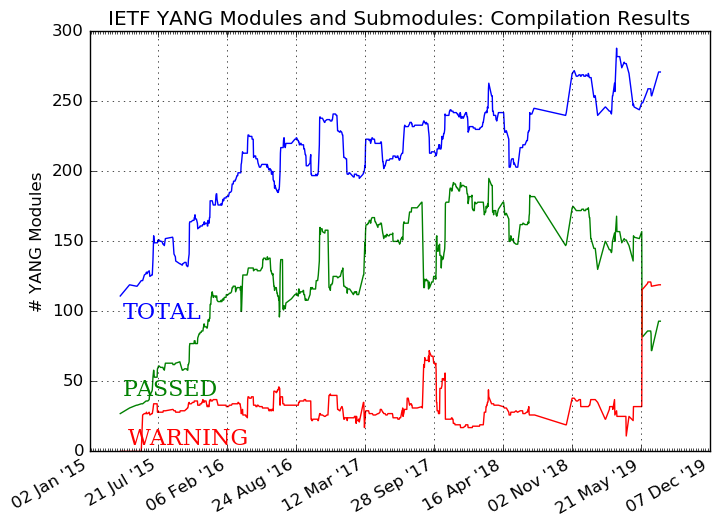 The YANG catalog now contains information about 3455 unique YANG modules from the entire industry: IETF, IEEE, Broadand Forum, MEF, cz.nic, sysrepo, openconfig, and some vendors (Cisco, Huawei).